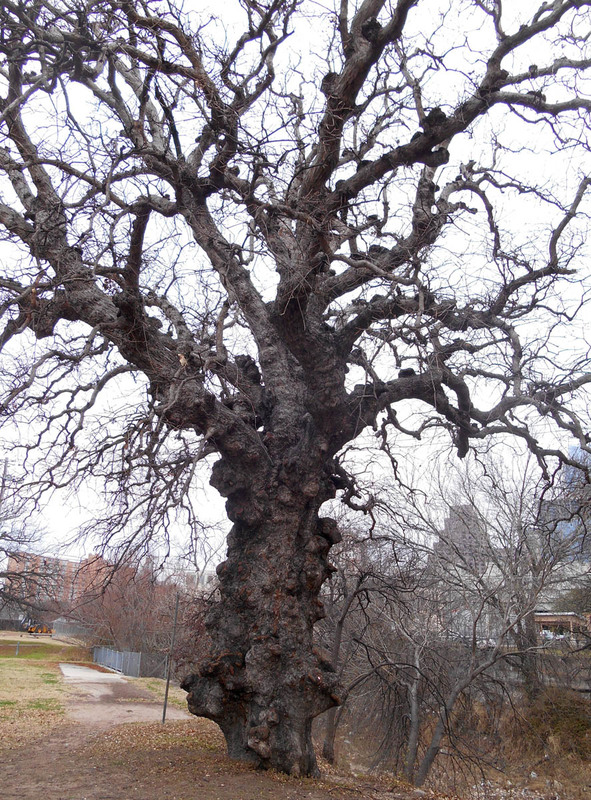 It was a cold, blustery day yesterday in Austin. Down to the low 40’s with a stiff 20 mph north wind. I was determined not to let the weather ruin one of my only two weekend days, so I put on my fleece pants, three layers of shirts/coats, fleece gloves and hat, and walked for almost five hours. I have decided I have just got to come to terms with this weather like I did while living in New York, because it does not appear that it is going to change any time soon. I received a very kind invitation to attend a Super Bowl party from my friends Monica and Derek of roadmaptonomad fame. We met when I was here last April, as they were also full-timing here in Pecan Grove. Due to work constraints, they had to come off the road temporarily, but still live in the Barton Springs area. We seem to have a lot in common despite our age difference, so I have enjoyed their company while here. But with all due respect to my football-loving friends, I am not a fan. I was married for 8 years to a man who worshiped at the altar of the pigskin, and just the sound of those words: “HE! COULD! GO! ALL! THE! WAAAAAAYYYY!” makes my stomach hurt. So I set off for a long walk to enjoy the atypical deserted downtown streets and quiet of the city. With no particular destination in mind, I found myself at the doorstep of our State’s Capitol, a place I had not been since my Freshman year of college over 40 years ago. The 218 ft dome covers the giant rotunda with a star at the top, 8 feet across. 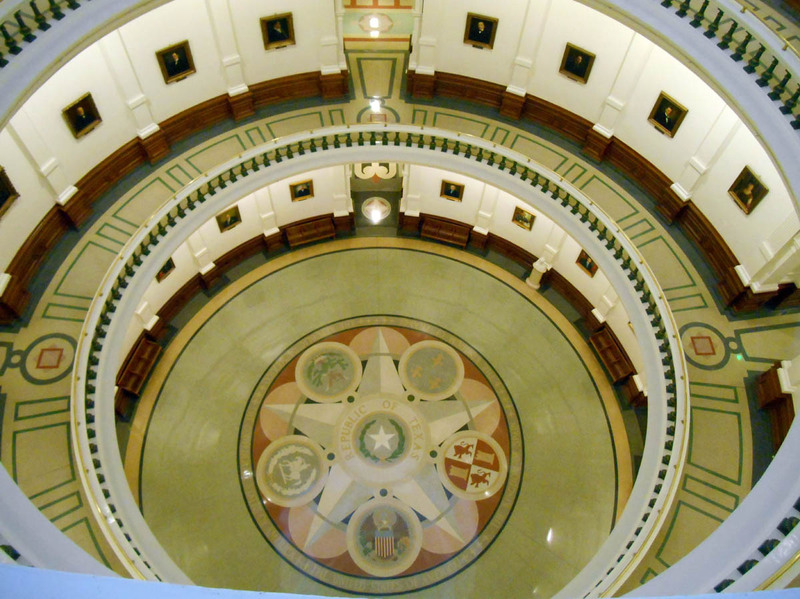 The walls of the first four floors are lined with portraits of every President of the Republic of Texas or Governor of Texas, starting with the current embarrassment, Rick Perry. Each time a new governor is elected, every portrait has to be moved back one space. It is interesting to see that we are finally recognizing our “roots,” too. 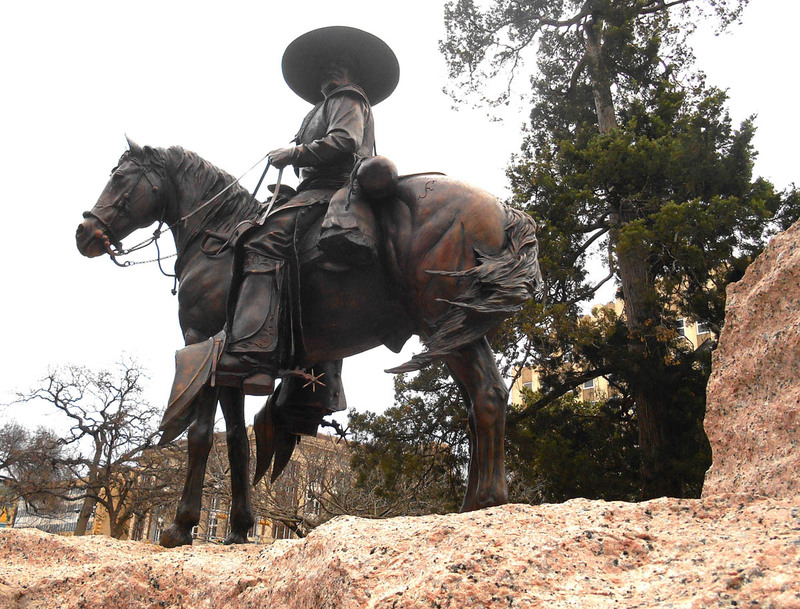 Two years ago, a massive 250-ton monument was built to pay homage to the Tejanos, the original cowboys. 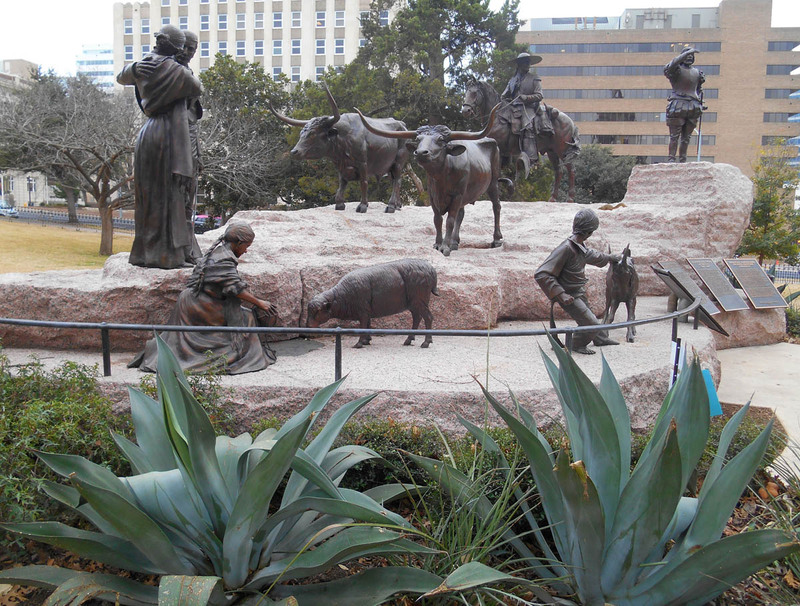 These Mexican and Spanish settlers and their longhorn cattle were here LONG before “we” arrived. Now there is one bad hombre! Whew! 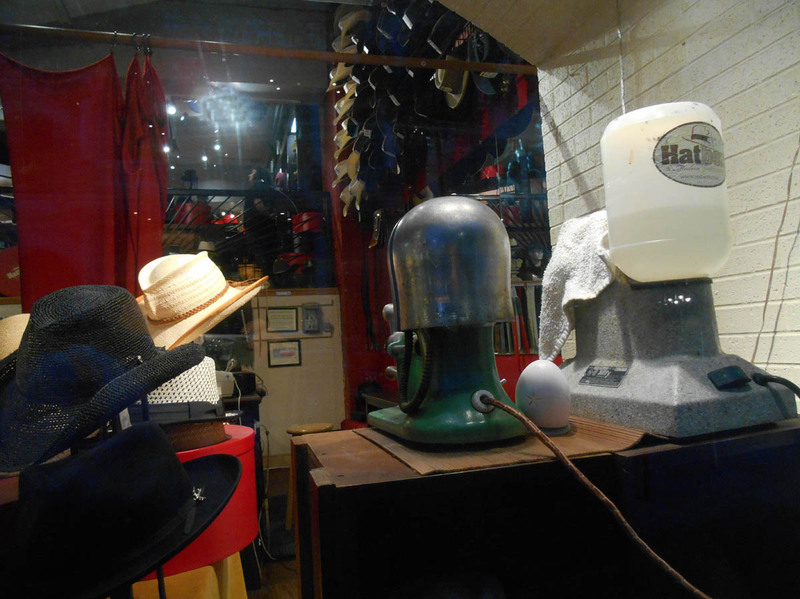 Glad things have changed over the years….or have they? Me: Excuse me sir, can you please tell me why the flags are flying at half mast? Him: Yes, Ma’am, we are celebrating a sniper. Me: Excuse me? You mean a sniper, as in someone who kills people? Which part are we celebrating? Him: We are commemorating the anniversary of his death a year ago, Ma’am. Me: That seems contrary to me. If a sniper is dead, shouldn’t we be relieved, not mournful? If he was a sniper, shouldn’t we be mourning the lives that he killed, not celebrating? I am confused as to why we would want to celebrate this? Him: Well, Ma’am, he was the greatest, most celebrated sniper of all time! He killed more people than anyone in our history.. 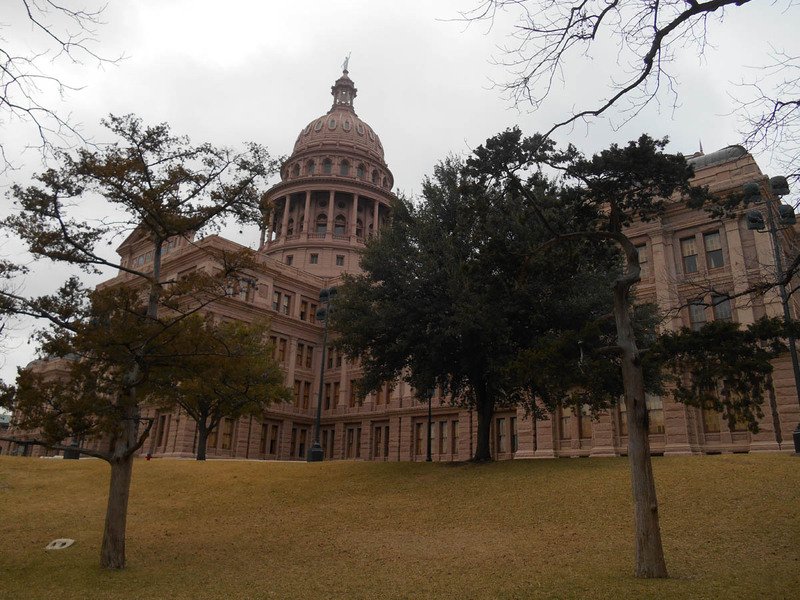 This entry was posted in Austin, Texas and tagged Tejano Monument, Texas State Capitol by Suzanne. Bookmark the permalink. Maybe the sniper was a military or police sniper that was killing the enemy, maybe more info is needed. Not that I approve of killing……Otherwise, I agree with you, it is strange. 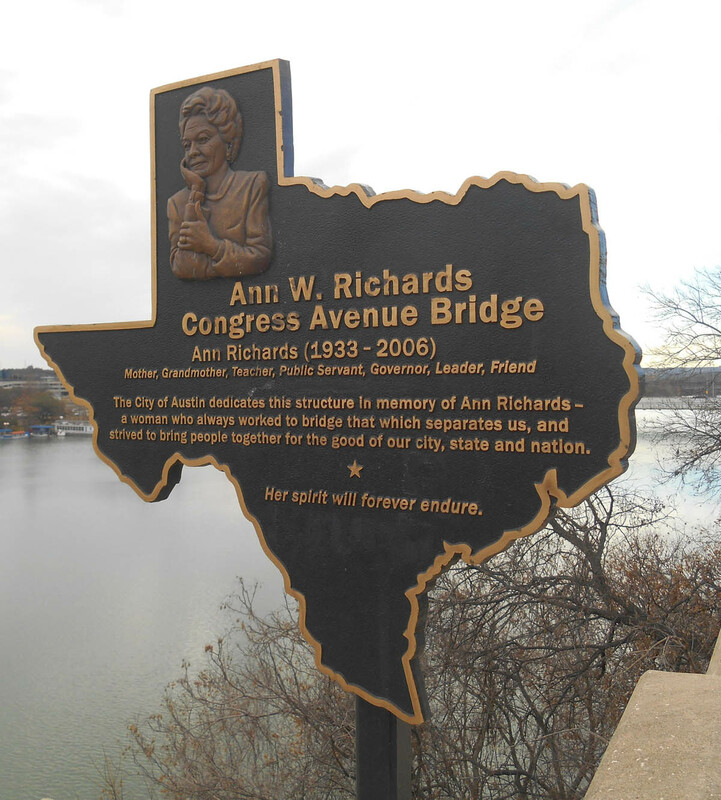 Hahaaa current embarrassment… ah me… there was only one Ann Richards and don’t you miss Molly Ivins.. well, Barbara Jordan… and now .. I do hope you still can vote there .. Wendy Davis? sounds wonderful. I love the State Capitol … and the UofT Stadium… very awesome slap dab downtown… you walked FIVE hours? blast my hide… I think I have run the marathon when I walk for an hour. But Austin is the place to walk. That’s one of the reasons I like it there… a great walk about city. What??? with the sniper? the dipshit… what language .. surely he meant the UofT Tower moron… whatever the hell his name was … good lord! you ought to report that security guard… that’s terrible… I think I’ll report him .. celebrating a sniper? Suzanne? please tell me you were drinking and heard that all wrong. Hi, Carolyn, thanks for the always lively comment! Yes, Wendy was who I had in mind when I said I hope Ann gets some company soon. 😉 What a fresh face that would be! I asked the guy if it was Charles Whitman, the Tower shooter. He said no, but he could not remember the guy’s name. I figured it out tonight when one of my FB friends shared a Tea Party post about Joe Namath at the Super Bowl, wearing a commemorative bracelet….It was that Navy Seal guy, Chris Kyle. His partner was from my home town, and they lined I-35 when the procession came thorough. I struggled with that security guard conversation, because I had difficulty making the paradigm shift from Charles Whitman, bad guy sniper to Chris Kyle, good guy sniper. Killing is killing, and though it may seem right to some, it is troublesome to me. 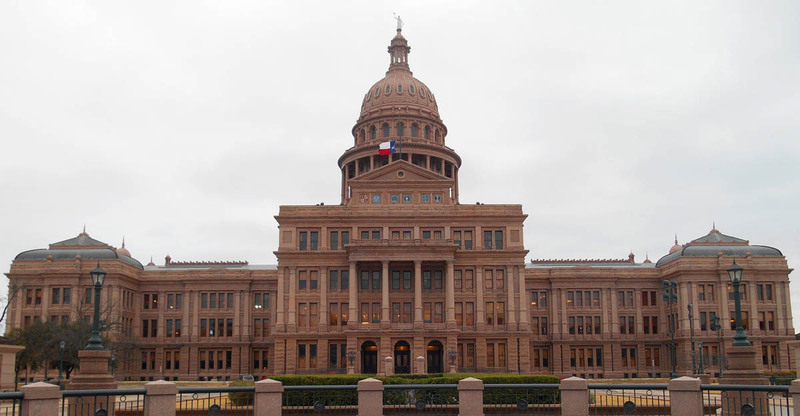 Hi, Sherry, I am not a fan of the Texas mentality, and I feel I can say that since I was born here and spent the first 35 years of my life here. 😉 With the exception of my five years in Austin, I never really felt like I “fit” but it took moving away to figure out why. I still have family here, otherwise I might be like Thelma and Louise, skirting the perimeter through all four states. LOL! With the exception of bluebonnet season, of course…everyone should see those beautiful fields of blue! However, it is football before God there. The “Game” was a waste of time, turns out; it would have been better to have gone for a walk. The Broncos were befuddled by Seahawks (sniff). And please, allow men an outlet for the primordial urge to kill something. BC Mark — My condolences about the game. If anyone needed a “win,” it is you these days! I did learn one bit of trivia about Davey Crockett while I was touring the capitol. He is the one responsible for the quote that I have seen on so many local tee-shirts, “You can all go to hell, and I will go to Texas.” Up until now, I just thought it was some A-Hole silkscreener with a Texas attitude. LOL! Davy Crockett said that? HAHaaaaa… I knew I liked that boy!